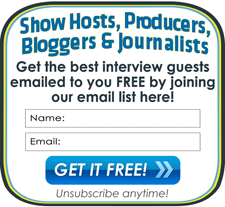 Interview Guests Directory - Find Guests for Podcasts, Radio, Articles, PR, and Press Interviews - Bump Your Listing Up to get more Interviews! Bump Your Listing Up to get more Interviews! Has your Guest Expert profile drifted down the page below newer submissions from other experts? With up to 25 expert profiles listed on just the first page of each category, it's easy for your profile to be pushed down by newer listings from competitor experts. Would you like to "bump" your profile back to the top of the category AND get it sent out in our email newsletter again? It's time for you to BUMP up your profile with our easy "Bump Service"! A one-time $20 "bump" will move your listing back up near the top where it's more likely to be seen by bookers and reporters. Plus, just one bump payment will bump your profile up in ALL the categories in which you're listed! Please just fill out the quick form below to tell us which profile is yours. We'll bump it back to the top AND email it out again for only $20. Your profile will appear again in our next email newsletter to attract more publicity. We will re-post your listing so it goes back to the top of each category page where your profile is listed, so it's easier for interviewers, journalists, and show hosts to find you. BONUS: One bump bumps your profile in ALL your categories, so you pay once but can get multiple bumps if your listing is subscribed to multiple categories. This even includes the Guest Stars category if you are listed there! Use of the Bump service requires a current Guest Expert Profile listing. Specific placement at the top of the page or in the email is determined simply by first come first serve based on the time of order received. This is not a permanent posting at the top of the categories - newer submissions and bumps by other experts will gradually move it down in the listings again. Please note that bumping your profile will give you better placement on our site but it will also change the URL of your listing. You may need to update any links you have posted to your profile. A Bump costs $20 as a one-time payment. There is no recurring charge.